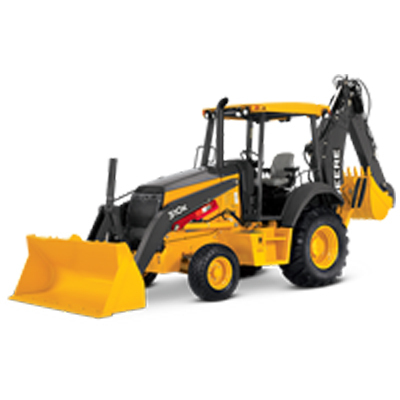 Want to get the most from your backhoe? Choose a John Deere 310K Backhoe Loader. Your operators will enjoy responsive near-effortless backhoe control and parallel lift that’s simply unparalleled. One of-a-kind electrohydraulic (eH) design delivers unsurpassed capability. With true parallel lift throughout the lift arc, it gives you the Ɵnesse to handle everything — from pipe to pallets. Load Height - STD 10 ft. 11 in. Load Height - EXT 13 ft. 11 in. Reach From Center of Swing Pivot - STD 17 ft. 10 in. Reach From Center of Swing Pivot - EXT 21 ft. 5 in. Reach from Center of Rear Axle - STD 21 ft. 4 in. Reach from Center of Rear Axle - EXT 21 ft. 4 in. Net Peak Torque 276 lb. ft.
Bucket Cylinder Dig Force - STD 11,106 lb. Crowd Cylinder Dig Force 7,006 lb.